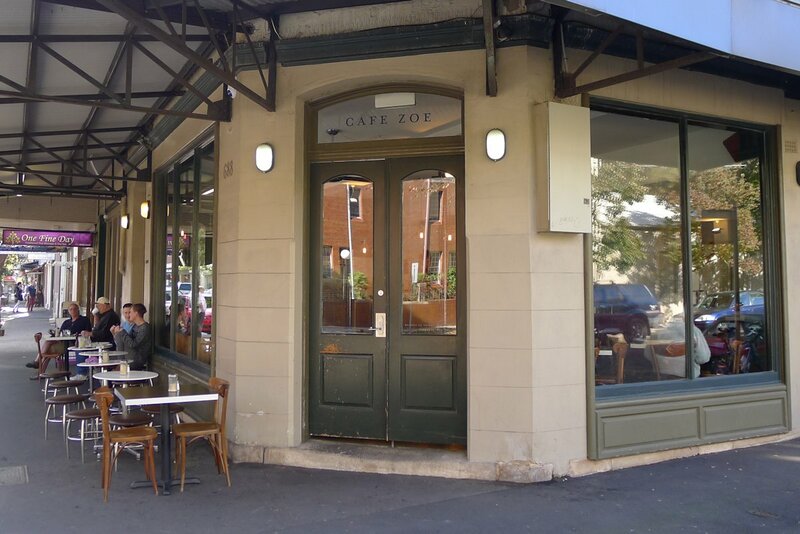 On a slightly quieter part of Bourke Street and away from the swathes of other cafés of Surry Hills, Café Zoe has forged its own reputation for excellent breakfasts. While it does get busy, the interior has quite a large capacity and staff were plentiful. There are also a few tables outside (which are shady in the morning) although with winter here, you’ll want to head inside for warmth! Our waitress was courteous, funny and helpful, offering everything we could have wanted. Be sure to check the specials boards inside and outside for the latest new offerings. Single Origin Roasters supply the beans and I was surprised by the fact that our coffees (regular $3.50, large $4) were quite weak. If you’ve had other experiences at Zoe, please reply in the comments. 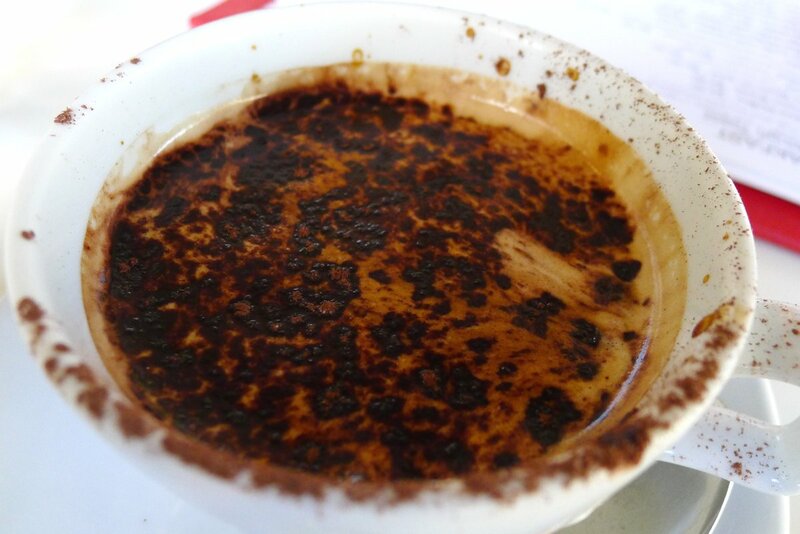 The drinks menu also offers English Breakfast, Earl Grey, peppermint ($4 each), green ($4.40) or Masala chai ($4.50) teas. You can order freshly pressed juice (regular $5, large $6) of almost any variety you can imagine including strawberry which I certainly don’t see often. Some recommended combinations are on the menu: apple, watermelon & strawberry, carrot, apple & ginger, or orange, pineapple & passionfruit. 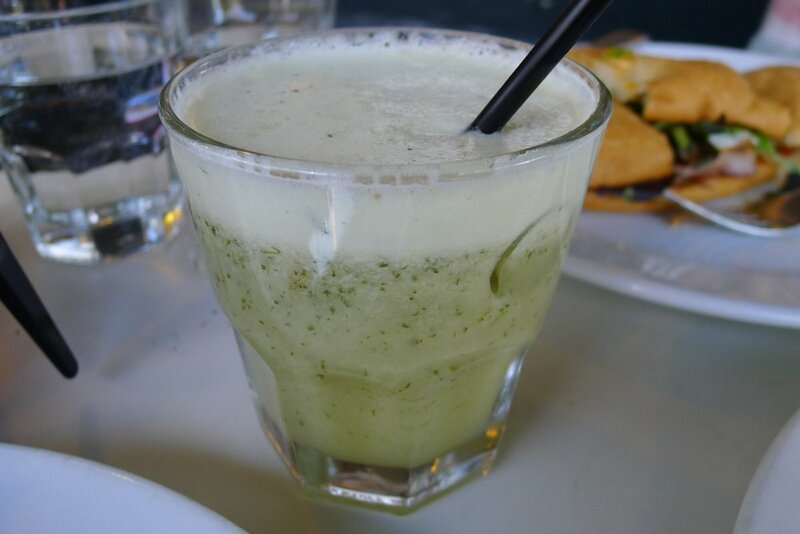 Our pineapple juice with mint was blended well and served quickly with ice, perfecto! 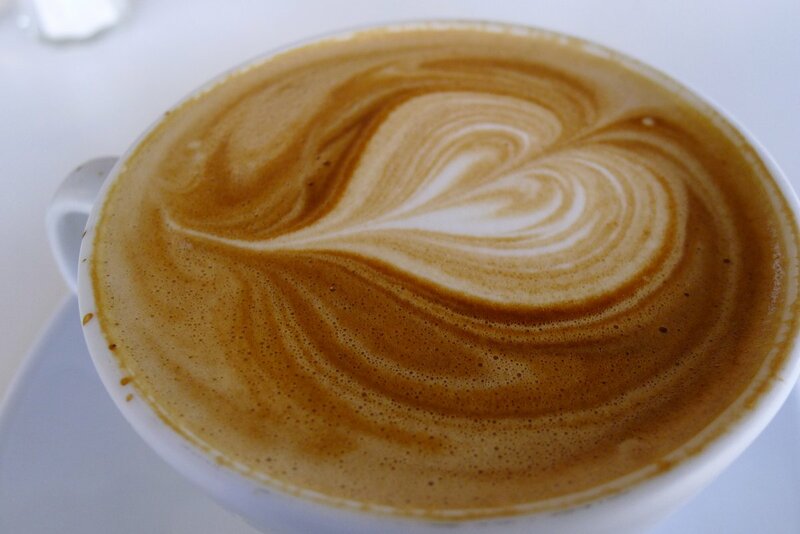 Sonoma breads are the choice here and Café Zoe puts them to excellent use. 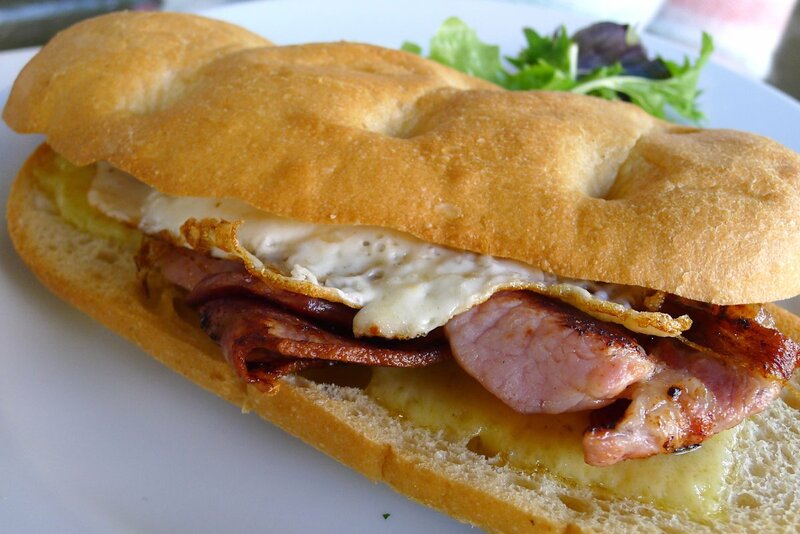 The bacon and egg roll ($8.90) is served with cheese on panini. The small amount of lettuce on the side worked well when we added it to the roll. Lashings of bacon and melted cheese turned this into an outstanding breakfast. The other two rolls available are the pork and fennel sausage and egg roll with caramelised onions ($8.90) and the BLT with mayo ($10.90). Both are again served on the panini. There are a variety of muffins available. 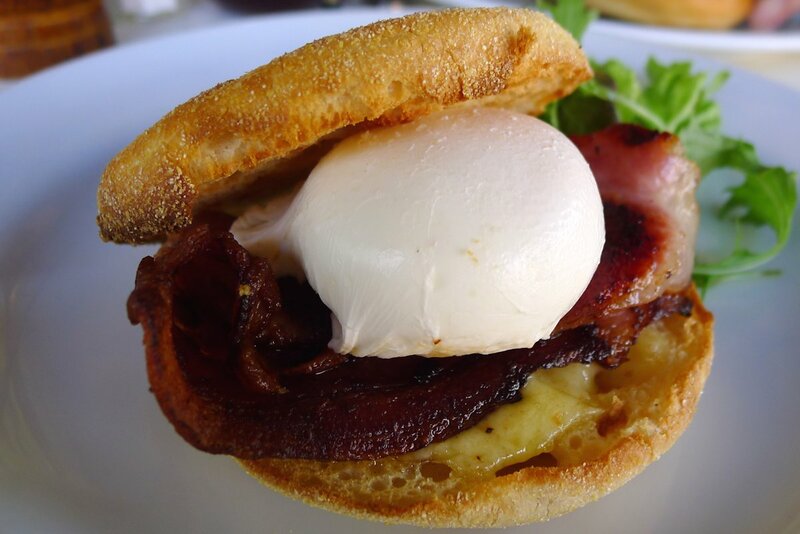 I opted for the bacon and egg muffin with cheese ($5.90) which I cannot fault. The egg was poached perfectly (I just popped it with the knife before squeezing down on the muffin though for fear it would burst) and once again, bacon and cheese rounded off this dish. The other muffins are: sausage and egg muffin with cheese, spinach and egg muffin with cheese ($5.90 each) and the salmon and egg muffin ($6.90). Definitely pancakes worth remembering! 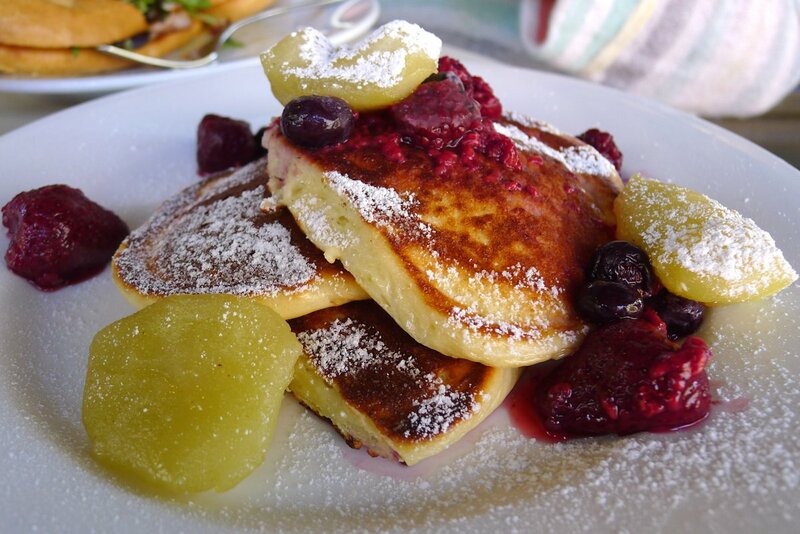 The ricotta pancakes ($13.90) are served quite simply, with some caramelised apple and berry compote. The apple was extremely soft and mouthwateringly delicious. Each bite with the fluffy pancakes was savoured. Our table definitely received its fair share of jealous glances. Highly recommended as a dish to share or keep to yourself. Other breakfasts on the menu include fresh fruit salad and yoghurt ($8.90), porridge with banana, berries or poached pear ($7.90), baked eggs with marinated minced lamb, shallots, zucchini and grilled chorizo ($13.90) and omelettes such as smoked ham, tomato, buffalo mozarella & basil ($14.50), chorizo with caramelised onion, thyme and cheddar cheese ($14.90) or mushroom, feta and spinach ($13.90). There’s also yet another handheld item which sounds delicious: the breakfast wrap withscrambled eggs, smoked leg ham, tomato salsa, ricotta, pesto and rolled in a spinach tortilla ($14.90). It’s obvious that Café Zoe knows its rolls, wraps, sandwiches and muffins. If it can be eaten with two hands, they’ll make a great rendition of it here. It became apparent that this establishment is also very capable at producing a multitude of excellent sweet and savoury dishes so it’s definitely one to remember if you’re in the area. This entry was posted in Sydney - CBD, Sydney - South and tagged Disabled access, Dog friendly, Free range eggs, Organic Options, Outdoor seating, Parking close by, Reasonable prices. Bookmark the permalink.